Each year, we request fleet data from our stakeholders to understand more clearly alternative fuel use in eastern Oklahoma. Because of this stakeholder-supplied information, we know that our stakeholders saved 4.8 million gallons of petroleum in 2015, and nearly 19 million gallons since 2009. Nationally, the Clean Cities program has saved 8.5 billion gallons of petroleum since 1993. We need your help to collect this information. In this fillable PDF survey, please provide information regarding your organization’s vehicle use, fueling stations, and fuel economy efforts in eastern Oklahoma from January to December 2016. 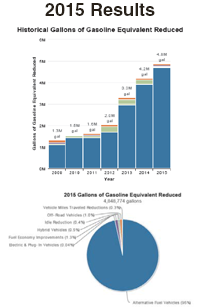 This information will be used in the U.S. Department of Energy’s annual report, detailing the increased use of alternative fuels and petroleum reduction measures in eastern Oklahoma. It’s Confidential. No identifiable information will be made public – all the data will be combined to show what our stakeholders have done collectively (see above charts or last year’s summary). Please submit your answers by March 1, 2017. ⚠ Important: If you are not the person in your organization who handles this information, please forward this link to them, or let us know who we should contact.